Sportspal Canoes are manufactured from Aircraft Grade Aluminum, which is then stretch-formed, heat treated and hardened. Lined with ethafoam (closed cell polyethylene) so they won't sink even if fully loaded with water. The two piece hull is joined at the keel, making Sportspal canoes very durable. Unusual stability and safety make these fine canoes excellent for family recreation or premier sporting. The special lining makes these canoes very quiet. A duck hunters gun's recoil will not flip the Sportspal, and his dog can climb in and out for retrieving game. Being very light, it is easy to portage. And, of course, since you virtually cannot sink a Sportspal, all that valuable gear that sportsmen carry have less chance of accidental loss. The Sportspal is designed to give year round use, adaptable to many sports activities. A wide flat bottom coupled with the side ethafoam sponsons makes Sportspal canoes the most stable canoes available. 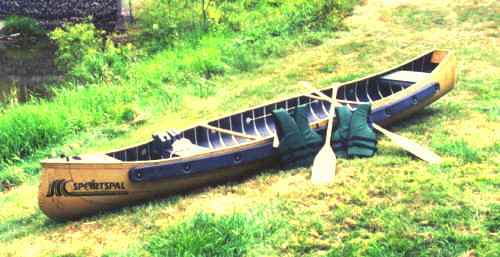 Sportspal canoes are made in the USA, and should not be confused with another canoe manufactured in Canada, whose hull is composed of thinner (0.022), softer (marine grade) aluminum. Receive news, sales notices and more.